Horticulturist/gardener Hannah Cortazzo is a transplanted New Yorker (no pun intended!). Growing up on a rare private property within the preserved lands and river system of the Ozark National Scenic Riverways in Missouri, Hannah says she never took nature for granted. Her love of plants, flowers and trees is on display in her workplace - the magnificent Conservatory Garden at New York City's Central Park. Its 6-acre Italian, French and English gardens are filled with 27 flowering plants, shrubs and trees. Spend the next half hour as Hannah shares the transformative effect a garden can have in our everyday lives. Victoria Herrmann's a woman on a mission - and what a mission it is. The 25 year old climate change specialist is a Bill and Melinda Gates Cambridge University Scholar and PhD student at the Scott Polar Research Institute. She also happens to be the Managing Director of the Arctic Institute, an inter-disciplinary, independent think tank made up of young professionals who work from locations around the world and who represent expertise in many different disciplines. When it comes to saving the planet, our conversation with Victoria is one you absolutely CANNOT AFFORD TO MISS. 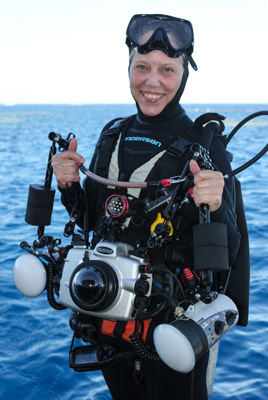 An internationally recognized underwater and conservation photographer, Michele Westmorland is a much sought after speaker who has lectured all over the world. While her topics are usually about marine and cultural life, she prefers to share the story of a Caroline Mytinger, a young American portrait painter. She and a female friend set out from San Francisco in the 1920s on a 4-year journey to the South Pacific to "record some of these people before they vanished forever." More than 80 years later Michele and her team embarked on a 2-month expedition to retrace their steps. What Michele has to share is riveting.